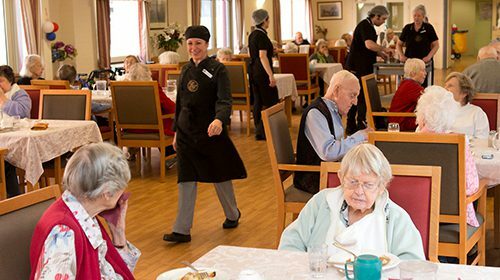 Residents enjoy socialising in our light-filled, spacious and well-appointed communal areas where they can participate in a range of daily activities. Or they can step away and spend time in peaceful lounge areas for reading and quieter pursuits. Our spacious, restful lounge areas filled with natural light are dotted throughout Eva Tilley for optimal access to social living and activities. With floor-to-ceiling windows, residents can take in views of our green courtyards and garden areas. With quality furnishings, including armchairs and sofas designed to provide support for aged-care living, our living areas are comfortable places where residents gather for a cup of tea or go for games and activities. 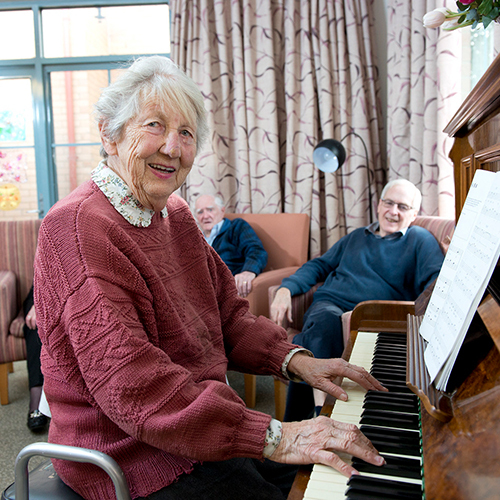 Many of our lounges include pianos so that music is part of resident’s lives during functions and other special occasions. Designated areas also feature television with Foxtel so that residents can stay up-to-date with the news, watch DVDs, sport games and favourite shows. Lounges include easy access to tea and coffee making facilities and disabled toilets. Residents can also retreat to tastefully furnished sitting areas for quiet time to read or to spend time with friends and family. Our main dining area on the ground floor is a place where residents can gather at tables of four to six people and enjoy home-style cuisine that is cooked in our very own kitchen. Our restaurant style dining also offers private reservations so residents can invite family and friends to join them for meals or special occasions. Other dining areas are also featured throughout Eva Tilley for a more intimate dining experience that’s easily accessed from the residents’ rooms. Residents can enjoy our secure courtyards and leafy garden areas for strolling, sitting in the shade or indulging their green thumb with gardening activities. These green areas also provide lovely views from our living spaces and rooms. 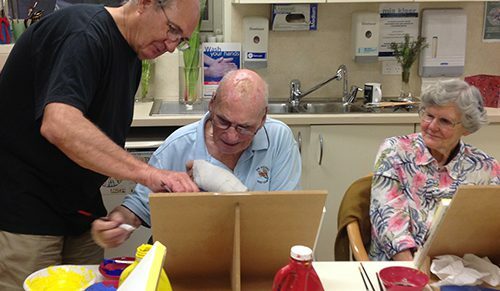 Residents enjoy an engaging and dynamic lifestyle at Eva Tilley. Our various activity rooms are welcoming spaces designed for our diverse lifestyle program that residents can take part in, including arts and crafts, choir and book group. You can rest easy knowing that your loved one is safe and secure at Eva Tilley. Our home features comprehensive safety, monitoring and security systems in common rooms, keypad access to certain areas and secure courtyards and gardens.